After a previous post where I listed my steps to printing success with the new Solidoodle Press, I am now on a roll with completing prints. My secret? Convert the Press to be more like one of the Up! series of 3D printers! Avoid the mess of glues and sprays – much of the success of the Up! 3D printers is that they use a perforated PCB as the printing plate. I bought 2 perforated boards from Jaycar and cut them to fit on top of the existing glass plate. A bit of masking tape is all that’s needed to secure them in place. Just make sure they’re completely flat, shiny side up. After watching all my early prints fail on the Press, I realised the other element the Up! printers combine with the perforated board is a good ‘raft’ base (automatically generated for the Up! ), creating a solid lock into the perforations and evening out any issues in bed level before you get to your product. This is not a feature available in SoliPrint, so for the print pictured above I actually modeled my own 0.5mm thick raft in CAD. While this is a bit more complicated if you’re printing downloaded models, it’s relatively quick to add using the freely available MeshLab or similar STL editing software. 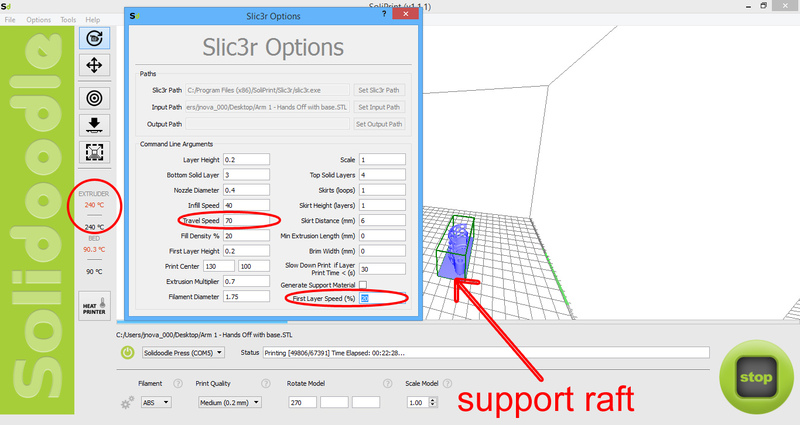 However if it’s your own design, it should only take 30 seconds to add this detail before exporting to an STL. Pictured below is the raft after peeling away from the Beer Bottle Lock, along with photos of how the Up! Plus 2 prints a raft before putting your STL on top for reference. Change the nozzle temperature and printing speeds. The Up! Plus 2 prints ABS plastic at 260 degrees, while the default for the Press is only 215 degrees. This is too low to properly melt ABS and let it flow. At the moment I’m using 240 degrees with good results, and also slow the printing speeds so that there is less shaking and opportunity for error. My settings from this successful print are below. I realise many people are having success using a variety of other hacks/fixes/additions which you can find on the useful SoliForum website, but this is my own twist on improving the Solidoodle Press. Also a big thanks to Solidoodle for releasing the new SoliPrint software version 1.1.1 which has corrected some of the bugs I initially wrote about. Finally, below are some detailed photos showing a comparison of the print from the Solidoodle Press (pink), to the same file printed on the Up! Plus 2 (green). The main thing I’m noticing is that the Press does an average job of flat surfaces parallel to the print plate, failing to fill them in completely like the Up! Plus 2. But the other surfaces are quite good! Of course it’s important to keep in mind the Press is about a third of the price of the Up! Plus 2, so expecting the same quality is asking a bit much. Yet I believe if Solidoodle continue to improve their SoliPrint software, the quality could really come close to that of the Up! Plus 2. Time will tell. If you have any questions about getting you Press to work, or want to share your own modifications, please post them in the comments section. My first free giveaway for the new year! 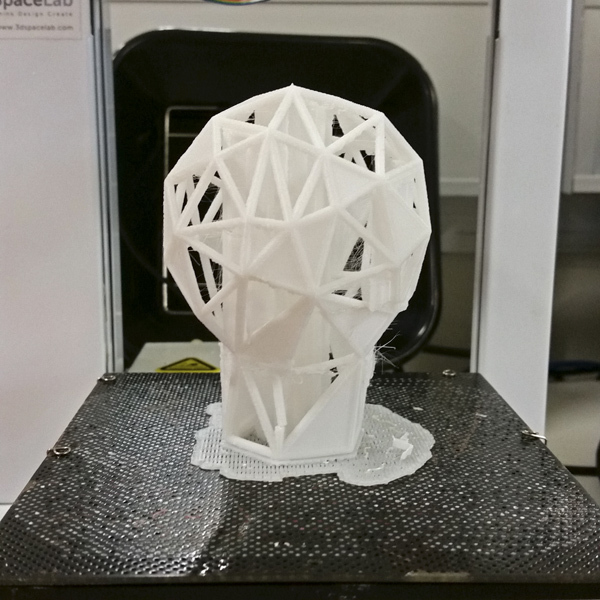 Click here to download the file ready to 3D print from Thingiverse. I literally had an old Ikea lamp in my hands ready to throw away when I realised I could give it a whole new life with the help of 3D printing. My only real restriction was the volume of the Up! Plus 2 printer I’m using. You can see the original Ikea lamp in the images above, and process of transformation into something with (I think) much more personality. Projects like this are extremely satisfying as I hate to throw things away, and really demonstrates the opportunities to extend product longevity through 3D printing. I’ve also taken some photos of the printing process so you can see the support material required. I knew this would be a bit painful and increase the print time, but while it looks like a lot the support is so thin that it really wasn’t too wasteful. I also have a feeling that there may be less support if I printed it upside down. If I need another one I’ll definitely try it out. If you make one I’d love to hear how it went and if you manage to print with less support. Just leave a comment here or through Thingiverse (along with photos). Happy printing! There is nothing better than getting away from the computer screen and into the workshop to test the fundamentals of an idea. It can be rough, dirty, ugly, but oh so useful! 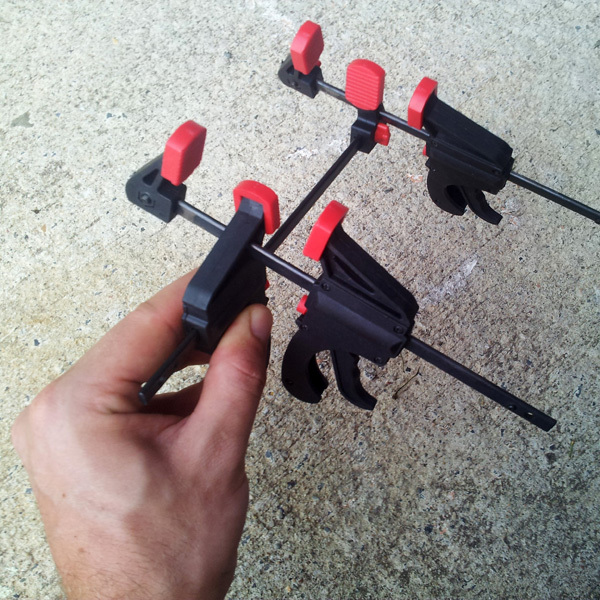 Case in point; a few clamps sliced and diced together to form an adjustable rig. Really quick to build and demonstrates what can’t be tested in sketches, and would take too long in CAD. Thank you Glenn Smith for teaching me the value of model-making and hacking! There was recently a story on Jonathan Ive discussing exactly this need for designers to learn “how to make stuff,” not just pretty digital images of a 3-dimensional object. Some projects just can’t be explained in detail… yet! But occasionally it’s fun to offer a few clues and ‘behind the scenes’ images of what I’m working on when I can’t actually say what I’m working on… if that makes sense. Designers you know what I mean!